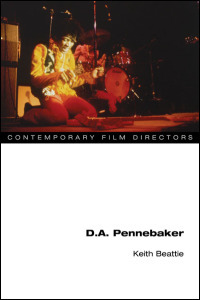 The image on the front cover of an edition of the University of Illinois Press’s popular series on Contemporary Film Directors (edited by James Naremore) features a still of Jimi Hendrix from D. A. Pennebaker’s concert film, Monterey Pop (1968). Gaudily appareled in orange trousers, frilled yellow shirt, and black waistcoat, Hendrix, kneeling on the stage over his guitar, seemingly appears trapped in some kind of hoodoo trance – half dancing, half casting a spell. For most, this still is quite a familiar image, as is this particular performance by Hendrix. (Midway through ‘Wild Thing’, he stripped himself of his guitar, doused it with lighter fluid, set it ablaze, and then smashed it, creating a sensational cacophony of distortion and reverberation. A great moment of rock lore indeed.) Whether one has seen just this concert performance – exhausted across documentaries, the internet and anything attached to Hendrix’s lore – or Monterey Pop in its entirety, one has seen a Pennebaker film. In addition to the rockumentaries, however, Beattie discusses Pennebaker’s camerawork for Jean-Luc Godard (One AM, 1971) and varied Norman Mailer films (Wild 90 (1967), Beyond the Law (1968) and Maidstone (1970). The section on Maidstone is most interesting for Mailer’s own directing methodology complemented Pennebaker, who also concentrated more readily on screen performance. Beattie understands that Mailer’s crude experimental approach to filmmaking, and drug-fuelled and alcoholic despondency, were behind his logic to give (the sober and more experienced) Pennebaker carte blanche to set up the scenes and improvise as to how ever he pleased. An example used to rout this point is the infamous fisticuffs scene between actor Rip Torn and Mailer: “Pennebaker, maintaining the directorial investment made in him refuses to cede the camera or to relinquish creative control, and he continues filming. Mailer recognized the value of what Pennebaker had filmed during the assault and included it in the final version”. (67-68) David James in Allegories of Cinema trumpets this scene as “one of the Great moments of American cinema”. Was it set up? What reality is being captured? Was it exploitative? Mailer and Pennebaker both cagily evaded answering such questions. Whether it is Pennebaker’s directed or cameraman-for-hire projects, Beattie’s focus is what he delineates as the “performed self”. This takes the argument away from the concept that observational filmmaking relies on the pretence that subjects are not aware of the camera (in spite of the paradox of a movie camera’s physical intrusiveness). An awareness of the camera is something that Pennebaker’s actors make no intention to hide. Dylan’s famous ‘Subterranean Homesick Blues’ cue-card sequence to open Dont Look Back, of him staring straight at the camera lens (in a music video even before such a thing existed) is the obvious example here. Characters in his other films – Primary (1960), Jane (1962) and Daybreak Express (1953) – all make the camera’s presence obviously known. David Bowie in Ziggy Stardust and the Spiders from Mars (1973) even uses it as a prop during the concert footage; backstage it becomes another of his entourage, constantly on the move to find space in the cramped and cluttered dressing room. In one delicious example illustrating Bowie’s vanity, he uses the reflection of the camera’s lens to gaze at his naked torso. Whilst the blueprint of Beattie’s book is to survey every one of Pennebaker’s films – a requirement of this publication series and a feat that he manages to squeeze in despite the limited scope of the 127 pages – this book delves much further to essay not just the documentary, but filmmaking practices of one of cinema’s most inventive and seminal figures. Successfully collapsing the borders between documentarian/fiction filmmaker-camerman/director, Pennebaker deserves his applause as one of the great filmmakers of this modern era; Beattie deserves his own for mining this fascinating, yet terribly neglected, field of contemporary film history. This book will become an important resource for anyone interested in Pennebaker’s oeuvre as well as contribute to conversations around the blurring of on-screen and off-screen performance.